Portland, Oregon’s Salt & Straw makes a killer coconut milk ice cream packed with gooey, tangy chunks of strawberry-rhubarb pie. I recreated it with easy to assemble ingredients. So great you won’t miss the dairy, and non-vegans will miss the fact that it can be vegan. After trying my sister’s scoop of Coconut with Petunia’s Strawberry Rhubarb Pie, I was enamored – and a bit envious of her choice. After I learned that its base consisted of coconut milk instead of dairy, I was floored. I’ve had nondairy, coconut milk ice cream before, but this version took it to another level. It was so creamy and had the melt-in-your-mouth texture of dairy cream, it seemed rich and indulgent. Back home on the East Coast, attempting to replicate that experience was a no-brainer. 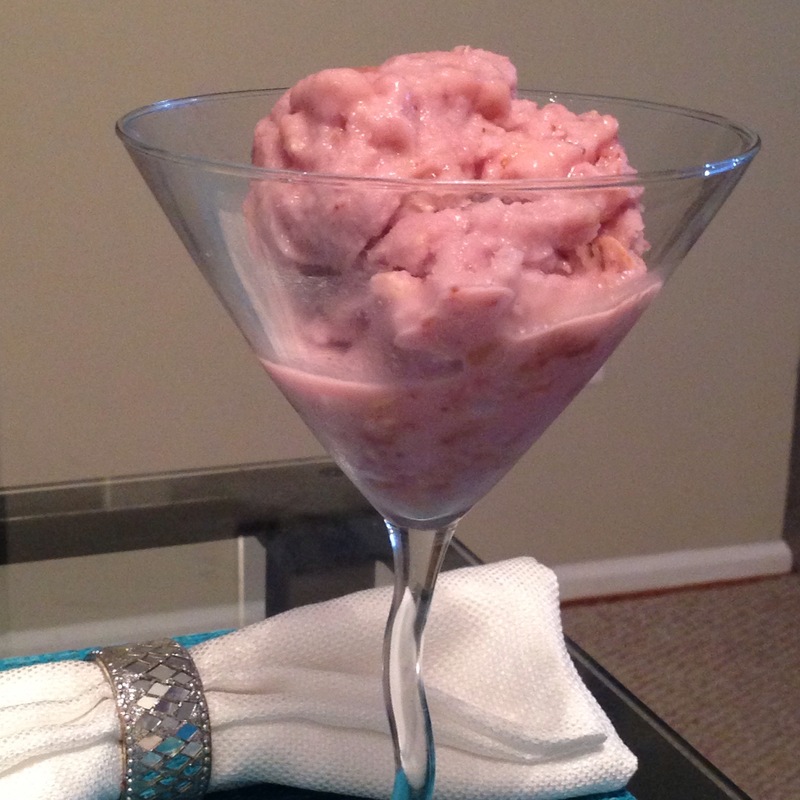 The resulting nondairy ice cream incorporates pureed fruit, which lightens it up for hot summer days poolside. It may be a relatively healthy reinterpretation of the strawberry rhubarb pie coconut ice cream, but it does not skimp on large chunks of fresh strawberry-rhubarb pie. My own version was not completely vegan, since I used a pie containing eggs, but if you can make your own or find an egg and dairy-free store-bought version, you can keep it vegan-friendly. I used Silk brand Original coconut milk. It has added (natural) stabilizers, which help it emulsify cleanly with the strawberry purée. Purists may want to use canned coconut milk or cream instead, which is richer and tends to have fewer additives. I purchased a ready-made, fresh strawberry-rhubarb pie from Trader Joe’s. It is all-natural, preservative free, and best of all, inexpensive at about $6. It also happens to have plenty of crust and gooey fruitiness, which make this a full-fledged dessert. By all means, if you’d like to make your own from scratch, go ahead! Personally, I believe it’s entirely too much effort for an ice cream mix-in. Since the recipe only calls for half of a pie, however, it’s a great use for the leftover pie we almost always have after large gatherings and potluck meals. Chill the pie 1-2 hours before freezing the ice cream. 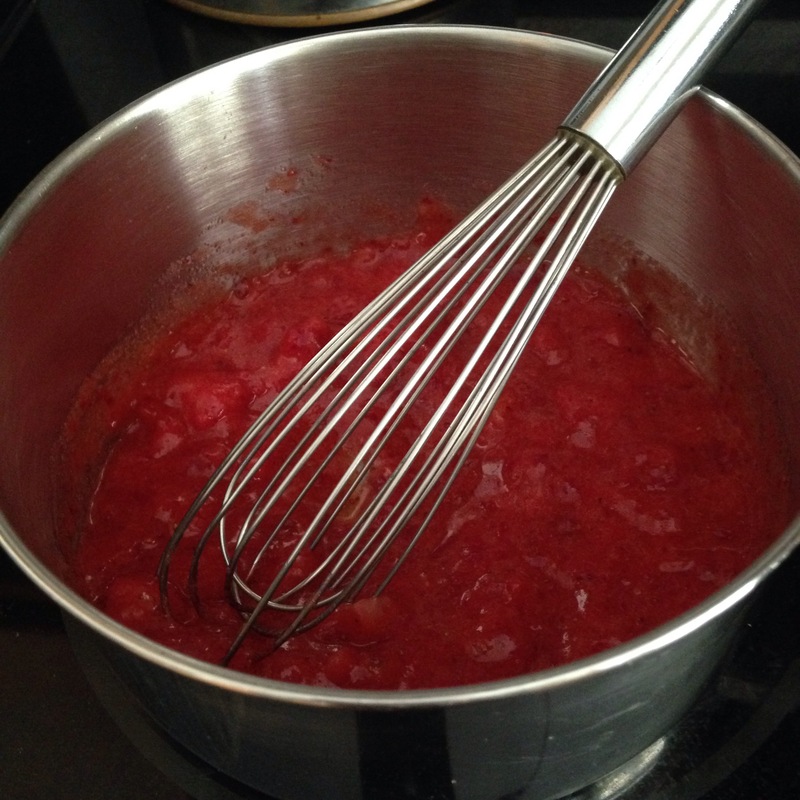 In a small food processor or blender, partially purée strawberries (or strawberry/rhubarb blend), leaving some texture. In a small saucepan, warm the puréed fruit on medium-low heat (3-4 setting out of 10). Add the citrus juice and wine (if desired) and bring to a slight bubble. Remove from heat and bring to room temperature. Transfer to refrigerator (or freezer to save time) and chill. Return puree to food processor/blender and gradually pulse in coconut milk until fully incorporated. Add vanilla extract and pulse to mix. Assemble ice cream appliance, add the coconut milk base, and freeze according to instructions. 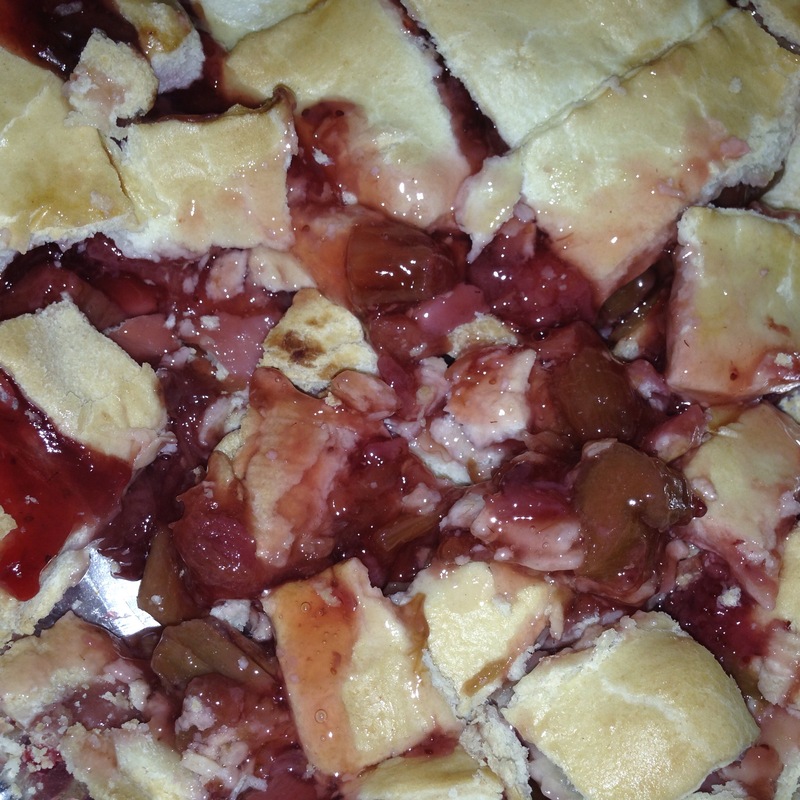 While the ice cream is churning, cut the pie into rough chunks. It need not be pretty! Just before the churning is finished, add in the pie pieces until dispersed evenly. Freeze for about one hour before serving. If storing long-term, freeze in airtight containers. Thaw for an hour before serving.